Hi folks, how would you like a vacation in New York to have a sight-seeing? I guess mostly love sight-seeing when having a vacation to relax from the work stress. Isn't it would be a great vacation you are wishing for places like New York? By the way, would you like to ride a bus like above? Are you excited to hopping-in with it? 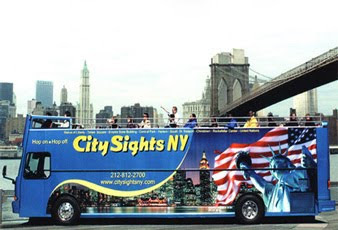 If I have the privilege of going to New York for a New York Sightseeing vacation tour one day, I would like to ride in a bus like the image above. I can imagine how it feel when I will be at the top of the bus. I can see the beauty of the place. The tourist attraction is awesome when seeing it widely with the comfort of the ride - an enjoyable ride! Then, stopping-by at the shop destination, and other interesting places of attraction. It will be so much fun, isn't it? And not only that being in a harbor cruise, a helicopter ride, boating, roaming around in the museums, or touring around the attraction places known worldwide are great things to enjoy while vacationing there. It would be so much fun. Places like these and rides like those surely will entertain tourist while being there. It would be fun!